The traditional approach to database scalability has been to simply buy a bigger box. 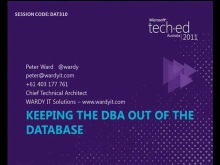 However with the ongoing data explosion that is occurring in organisations today there is a need to re-think how to achieve scalability for the database platform. In this session we will explore how to deploy Microsoft SQL Server into a Private Cloud and how to extend this scalability as a Hybrid solution using the Azure platform. With nothing more than a credit card and the Azure platform you will see how it is now possible to create highly-available, infinitely scalable SQL Server environments that support automated deployment and elastic scale. I am a DBA – Why should I care about SQL Server 2008 R2?